There are two places that I know well on the South Downs, Ditchling Beacon that I remember camping on one night in the late summer, and the other is Beachy Head. I remember walking up the hill to the top to look out and being terrified as a boy of going anywhere near the edge. 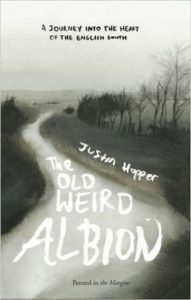 It is Beachy Head where the American writer and artist Justin Hopper begins his book with his grandfather’s first wife, Doris Hopper, seen standing at the edge of the cliff and in the next moment then seen to be falling. This act would leave an echo in his family history that almost no one would speak of. His journey to find her will take him along the chalk ridge from Winchester to the sea. Along the way, he meets pagans, eco-therapists and someone who knows something about crop circles. But this is not just about the people, it is also the landscape that Hopper wants to discover more about. Where I live at the moment has lots of history draped over the landscape and it turns out that Sussex is not a lot different to Dorset. There are layers and layers, some more visible than others; the landscape of cold rivers, standing stones, old churches and prehistoric remains that show how and where humanity has existed along this route and the pagan elements that existed for hundreds of years that are still present if you know where to look. As Hopper unravels his complex family history to find out more about the tragic death that was not spoken of, he ventures into the surreal and the unknown. All the way through the book he uncovers more details about Doris, giving him a glimpse of her life and up to the point she stood at the top of the cliff. As an American with English relatives, he has some of a sense of who we are as a people, but he can also take a wider perspective too on our culture and foibles. I ended up liking this a lot without having a sense of being able to say absolutely why, but it is probably the mix of personal discovery and his explorations of the landscapes. As he travels the thousand-year-old paths over the chalk downs it really is the foundation and bedrock of the book. As a little aside, I really liked the brilliant illustrations from the artist Mairead Dunne at the beginning of each chapter. Fab review sounds like another my husband would enjoy.